Harry Chapman Pincher is a legend among journalists. As an investigative reporter, he struck terror into those trying to hide the murky secrets of state. After early careers as a teacher, a scientist and a soldier, Chapman Pincher joined Lord Beaverbrook’s then all-powerful Daily Express in the summer of 1945 – and quickly became the master of the journalistic scoop. His first splash, a top-secret account of the development of the atomic bomb, sparked a furious transatlantic row. It was only the start of a career in which his name became synonymous with high-level exclusives from the most secret corners of government. When he finally retired from journalism, the leaks kept coming, leading to a series of best-selling books on the infiltration of Britain’s intelligence services by Moscow which culminated in the allegation in Their Trade is Treachery that the head of MI5, was a Soviet spy. Colourful, indiscreet and compelling, this life of a true journalistic colossus also reveals the secret history of the century he bestrode. His tales of espionage and betrayal in this enthralling memoir belong to a world that younger readers might struggle to believe existed. He writes as directly and vividly as ever. His biography is absurdly colourful. Chapman Pincher was arguably the greatest scoop-hunter of postwar British journalism. The man is a marvel. These engrossing memoirs contain enough material for twenty thrillers. 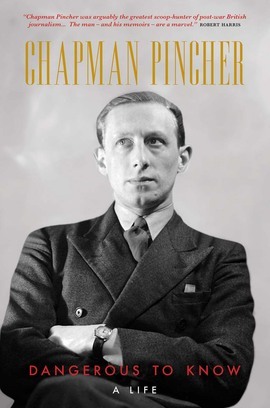 Chapman Pincher is a legend – truly, a larger than life figure, one of the greatest reporters of the golden days of Fleet Street and still going strong at nearly 100 years of age. If you want to know how to ferret out a jewel of a story from the bowels of our security services, then read this book.